Machine Knitters, Hand Knitters, Sewers, and Crochet Designers will all Enjoy her History below. Knitwear Fashion Designer Chris Ferguson of c jae knits has retired. Her Unique Hand Loomed Knit Garments will be missed in the knit fashion industry. 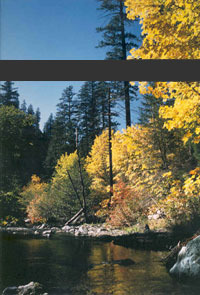 NOTE:Click on image to see an enlargement of the photo! Knit sweaters for men or women and ladies knit tops hand loomed from the same fashion yarns that c jae knits used can be found in our Bread and Butter Basics Showroom, One of a Kind Showroom, and in our Online Knitting Catalog. The end of the Fashion Season yarns become yarn kits with available hand knitting patterns and machine knitting patterns as they are written for our Patterns and Kits Category of the Bread and Butter Basics Showroom and Our Online Knitting Catalog.This will give all of you hand knitters and machine knitters the opportunity to buy these same yarns as used in the fashion industry. Create your own hand knit garments or purchase one of the available patterns in The Knit Tree's online knitting catalog written by Sharon Nani.You can also find Sharon Nani's technical articles and hand or machine knit patterns that she previously wrote for Inkknitters, Machine Knitters Source, and Machine Knit America on The Knit Tree's Article page, these are being added to the article page as they are converted for the web site. At an early age I was always sewing, crafting, or knitting something so it was only natural to start my journey into the "Fashion World" as a piece-rate sewer for Jantzen. For 21/2 years I not only learned about and used the many different sewing machines but also gained knowledge about running a garment company - something I found very useful years later. The next leg of the journey led me to Franco Guerri Knits as a sewer. Soon I was invited to learn about machine knitting----and a new world opened up. At that time, Sharon Nani from The Knit Tree, was the trainer for these machine knitters. Always with an encouraging word, Sharon took me through the basics and then into finesse. I learned to knit on passap, brothers, and studio knitting machines - also known as hand looms or hand looming. For me, a knitting machine is what a car is to my husband - by sound I know if everything's working well. I can feel if a new yarn isn't running the way it should. How exciting it was, (after turning into a pretty good knitter), to work along side a designer like Hillary Smith, to watch her create and to be able to produce her ideas. How exciting it was to watch colors and yarns and graphics come together. I was sad, after having worked with Hillary for several years in her knitting shop, that she decided to move. The new owner just accepted production contracts from other fashion designers and knit samples for the designers. I stayed on with the new owner as a production knitter but something was so lacking. 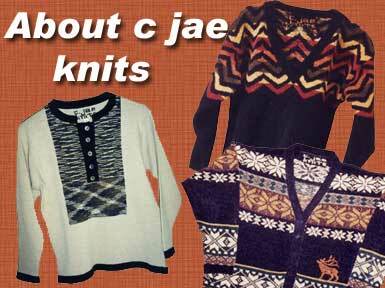 So, when she closed her doors and with a lot of encouragement from my husband, I started my own company, c jae knits. C jae knits grew from a cottage industry in my home into a knitting factory, with sweaters selling from the east to the west coast, selling in many fine shops, boutiques, and dept. stores - Nordstroms for one. For years it was exhilarating, but more and more time was spent away from my family -----I didn't want to totally retire from the knit wear fashion industry so I went back to cottage industry knitting for several years and slowly weaned into retirement. C jae knits worked with several fine yarns from Silk City Fibers.........quality rayon chenille, soft and plush, shimmery skinny majesty and rayon boucle, in solids and variegates, with a lovely drape, comfy 2.2 cotton, in standard and bulky knits, wool crepe and velveen for a defined look, perle cotton, lighter weight and easy care. Sometimes a new yarn was introduced, like chunky wool or Egyptian cotton and there is always new yarns on the horizon to inspire future knit wear designers.